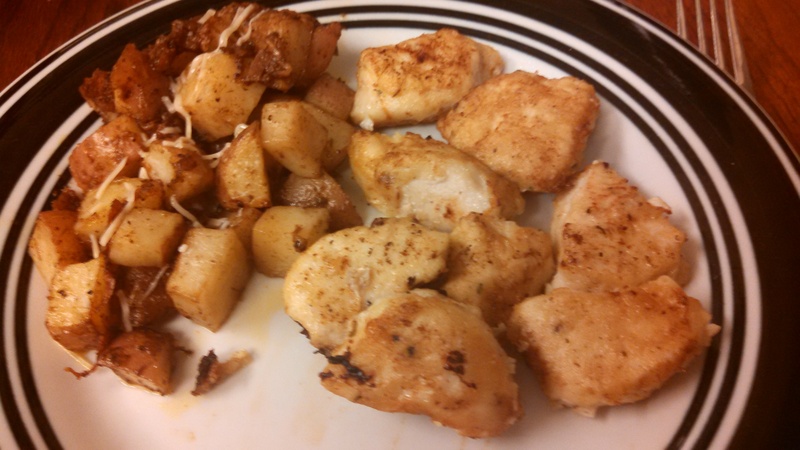 For the nuggets, I did not follow the recipe, by accident, and therefore I don’t know how they compare to Chick-Fil-A (also considering I’ve never eaten from there). I FORGOT THE PICKLE JUICE, which I feel is a key ingredient, due to the uniqueness of it. I also realized that I didn’t have any powdered sugar so I subbed a little bit of granulated sugar, I didn’t have celery salt so I omitted that, and I used olive oil instead of coconut oil. I suppose this means that I can make this recipe again, because it’d be a different dish! 😉 But we shall see if that happens. Despite my flub, they still turned out pretty tasty and my husband and I gobbled them up. The potatoes were pretty tasty as well. 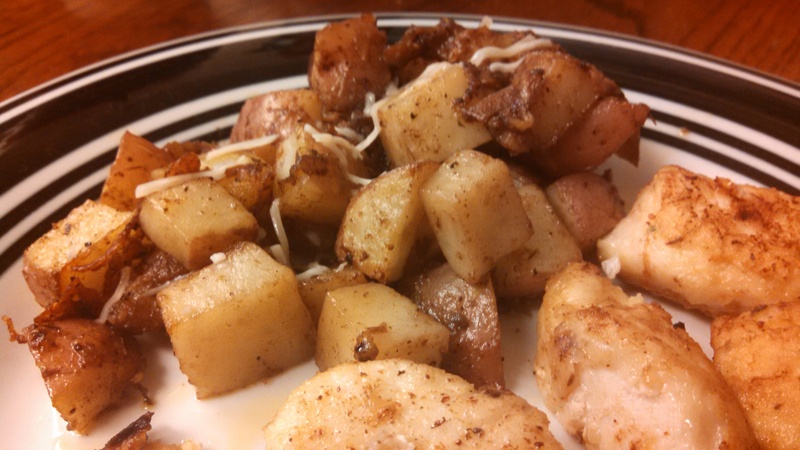 One thing I have noticed about potato recipes is that most of them turn out to be fairly similar. Each recipe I find claims to be THE best potato recipe, but I don’t know if I agree. Honestly, I miss real French fries sometimes…as in, the fried and unhealthy and crispy kind. Baked or roasted potatoes/fries just don’t give that same feel, no matter what the recipe that I find claims. My friend has a Holy Grail beauty blog, and I guess you could say I am still in search of my Holy Grail potato recipe! -Slice chicken into bite size pieces and marinate in the pickle juice for at least an hour, if possible. -In one bowl, beat the egg with the egg white and milk, and in a second bowl, combine the flour, sugar, and spices. -Dredge each of the chicken pieces into the egg mixture covering on both sides, then dredge in the flour mixture. 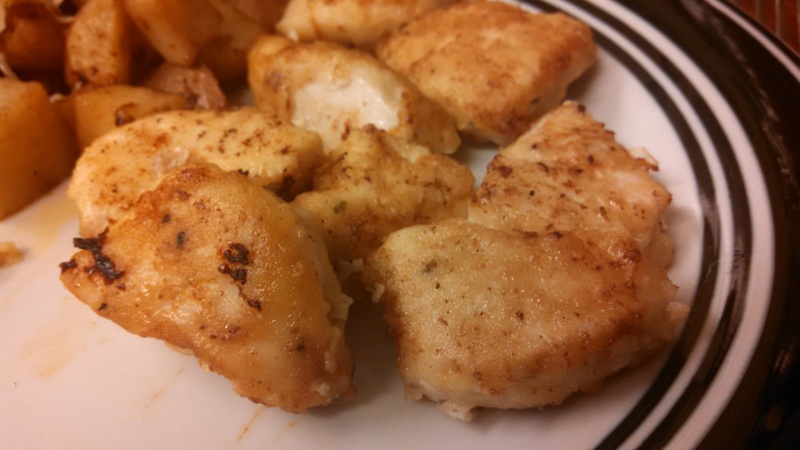 -Heat the oil in a skillet, and fry the nuggets for about 2 minutes on each side, or until golden brown and slightly crispy on the outside. -Remove and place on a plate, blotting excess oil. Serve immediately. -Lightly spray a baking dish, then place the cubed potatoes inside. -Pour the olive oil, spices, and cheese over the potatoes, mix well into the potatoes, so that they’re as evenly coated as possible. -Bake for 15 minutes, toss, then bake for 10 more minutes (note: adjust baking time as necessary).